An easy, attractive, and convenient way to organize your jewelry. Are you tired of fumbling through a disorganized pile of jewelry? Has your jewelry collection outgrown your traditional jewelry box? Would you like to easily keep different types of jewelry separate? How great would it be if you had a large mirror built into your jewelry organizer? How about a jewelry cabinet that can easily be mounted to a door or wall? If you answered yes to any of these questions then the lockable jewelry cabinet by Mayberry Health and Home may be the perfect solution for you. 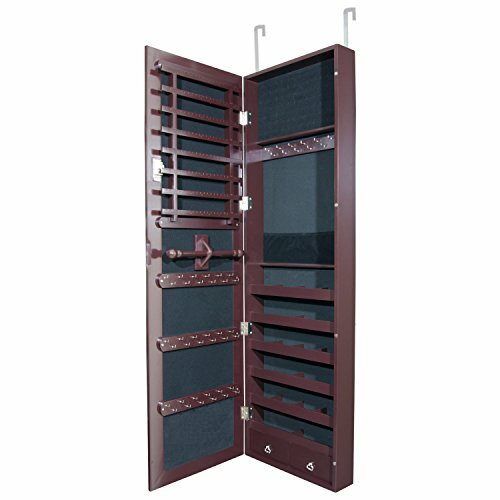 The jewelry organizer is perfect for those who plan to have a large collection. Get organized in a hurry using the numerous compartments, slots, hooks, shelves, and drawers available including 72 earring holders, 91 ring slots, 12 long and 36 short necklace hooks, 6 shelves, 2 drawers, and a solid wood rod. One of the big benefits of the jewelry cabinet is the built-in, full length mirror that ensures you always look great whether you're preparing to go out or just testing different styles. We know what you're thinking: With such an awesome jewelry collection how do I keep my jealous friends and family out of the cabinet? Not to worry - We've got you covered because each armoire comes with a built-in lock with stainless steel key! You decide who gets access! Not only does the organizer look attractive on your door or wall, but it's also really simple to install. Simply attach the hooks to hang over the door or use the screws to mount directly on the door or wall. The hardware and instructions you'll need are included. A drill may be necessary if you plan to use the anchors and screws. As always, you can contact us if you have any questions or concerns. We also offer a 100% satisfaction guarantee. If you are dissatisfied or find a defect, then we will replace the product or refund your money. SPACIOUS AND CONVENIENT STORAGE: Easily locate your prized piece of jewelry in this classy, compartmentalized, and spacious storage solution. STYLISH AND DURABLE: Hang over the door or mount directly on the wall for an attractive and secure alternative to traditional jewelry boxes. Fancy key included. LOOK FABULOUS: Full length mirror ensures that you look amazing before leaving the house, entertaining guests, or just testing out different styles. EASY ASSEMBLY: Simply attach hooks and hang over the door or use screws to mount directly to the wall or door. Hardware and instructions included. 100% MONEY BACK GUARANTEE: We offer a 100% SATISFACTION GUARANTEE. If you are dissatisfied, then we will replace the product or refund your money. If you have any questions about this product by Mayberry Health and Home, contact us by completing and submitting the form below. If you are looking for a specif part number, please include it with your message.